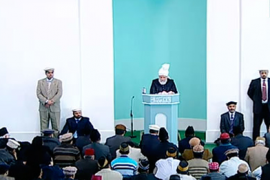 Today’s Friday sermon was based on observations of Hazrat Musleh Maud (may Allah be pleased with him) regarding the Promised Messiah’s (on whom be peace) high regard for the honour of the Holy Prophet (peace and blessings of Allah be on him). Lekh Ram was an influential Arya Samaj Pandit who routinely used abusive language for the Holy Prophet (peace and blessings of Allah be on him). At one occasion when he greeted him, the Promised Messiah (on whom be peace) ignored him and explained to his own followers rather fervently that he did not think much of his greeting because he abused his master. He felt there was no need to give him any importance in light of this. The Promised Messiah (on whom be peace) adored his children, especially his young son Mubarak Ahmad. He once felt pain in his ribs when lying down which was not alleviated by warm compress. It turned out that there was a broken piece of brick in his pocket which had caused the pain. The piece of brick was in his pocket because young Mahmood (Hazrat Musleh Maud) had given it to his blessed father for safekeeping and he had lovingly kept it in pocket. Once young Mubarak Ahmad, who everyone thought was the most adored child, uttered something which was contrary to the dignity of the Holy Prophet (peace and blessings of Allah be on him) and the Promised Messiah (on whom be peace) gave him a sharp smack for it. The Promised Messiah (on whom be peace) once came to know that although assurances were given that there would be no verbal abuse aimed at the Holy Prophet (peace and blessings of Allah be on him) at a convention held in Lahore that is exactly what happened. This convention was attended by Hazrat Maulawi Hakeem Nur ud Din Sahib (may Allah be pleased with him) and young Hazrat Musleh Maud (may Allah be pleased with him). The Promised Messiah (on whom be peace) was very annoyed with them both and said how could their sense of honour for the Prophet abide them to keep sitting in such a gathering! A debate with Abdullah Atham, a Christian missionary is published in the Promised Messiah’s book ‘Jung e Muqadas’. This was after the Promised Messiah (on whom be peace) had claimed to be the Messiah and the Maulawis had passed their edicts of disbelief and ‘liable to be killed’ on him. Yet when he was asked by non-Ahmadis to speak at a debate with a Christian he readily agreed to uphold the honour of the Holy Prophet (peace and blessings of Allah be on him) and Islam. It was a lengthy debate at the end of which and following his heart-rending supplication it was revealed to the Promised Messiah (on whom be peace) that the party who had lied in the debate would be hell-bound within 15 months unless he became inclined to the truth. When Abdullah Atham did not die within 15 months people raised clamour and derision that the prophecy was false. One of the companions of the Promised Messiah (on whom be peace) responded with grandeur that who said Atham was alive, he was like a dead man walking. Indeed, some people appear alive but are in fact dead while others appear dead but are living, like those who die in the cause of God. And some ‘living’ people appear dead to those with spiritual insight. Atham not only met his spiritual death but also physical death after a short while. When the 15 months were about to end people prayed most passionately and heartrendingly for his death in order for the prophecy to be proven true. However the Promised Messiah (on whom be peace) was displeased by this because he said who would have more sense of honour for the fulfilment of His words more than God Himself? Indeed, the prophecy was fulfilled with all its glory but was just averted temporarily. When Atham had heard the words of the prophecy he went pale, started trembling and repented. He was frightened and following this he stopped his opposition and did not write anything hostile, and ultimately met his end. The prophecy about Atham was indeed conditional and had he had confidence in his belief of Jesus Christ he would not have been so perturbed. The prophecy said that if he was inclined to the truth, it did not say if he became a Muslim. He had called the Holy Prophet (peace and blessings of Allah be on him), God forbid, Dajjal and after listening to the prophecy had repented. Divine chastisement does not befall when people have false beliefs; it befalls when mischief is made. False beliefs will be dealt with in the Hereafter while mischief-making beckons chastisement in this world as well. When the Christian missionaries were tired of their unsuccessful ploys they got together with some Muslims and gathered some blind, deaf and dumb people and said to the Promised Messiah (on whom be peace) that since he claimed to have come as the second-coming of Jesus in the metaphorical sense, could he cure the blind, deaf and dumb as Jesus (on whom be peace) used to. The Promised Messiah (on whom be peace) replied with great aplomb and said that the Jesus he claimed to have come in the likeness of did not physically cure the blind, deaf and dumb according to Islamic teaching. He told them it was their, not his, creed that he did so and the Bible says that anyone with an iota of faith can move mountains. He said he would only show that kind of miracle which his master the Holy Prophet (peace and blessings of Allah be on him) showed. However, since their Bible said that anyone with an iota of faith could move mountains, why did they not cure the blind, deaf and dumb who were present! Of course the influential priests utterly panicked at this and were clueless! Mir Abbas Ali was a follower of the Promised Messiah (on whom be peace) who later renounced his faith after being misled by maulawis. Mir Abbas Ali was a person of great spirituality and the Promised Messiah (on whom be peace) had even received a revelation about his spiritual strengths. However, when Mir Abbas Ali let arrogance and conceit get to him he renounced his faith. Man is ever prone to hypocrisy and disbelief and these two flaws usually attack those who have been blessed by God. Indeed, it is mentioned in Surah Al Fatihah about the Jews and the Christians, that they lost their way after being recipients of Divine blessings. It should be remembered that the prayer for protection from evil at the end of Surah Al Fatihah should be made with the idea that may God always include us among those who receive His blessings. The Promised Messiah (on whom be peace) once sent a parcel to someone and placed a letter in the parcel. He did not know this was against the law. A case was filed against him and the Promised Messiah’s (on whom be peace) lawyer asked him that since the parcel was not opened at the other end in front of any witness the Promised Messiah (on whom be peace) should plain deny sending a letter in it. The Promised Messiah said it would be untrue to say so and he was not prepared to do it even though the lawyer told him he would definitely be penalised. During the court case the Promised Messiah (on whom be peace) most honestly admitted to placing a letter within the parcel but said he did not know it was against the rules. The prosecution side gave a long-drawn speech which did not impress the judge. In the end the judge exonerated the Promised Messiah (on whom be peace) and the case was dismissed. This incident is often cited and it gives us a standard of honesty to maintain. However, people living in these countries act contrary to this when seeking benefits from the government, when seeking asylum or in insurance cases. Ahmadis who do this should think about it as dishonesty does not behove Ahmadis. The Promised Messiah (on whom be peace) often said that Hazrat Abu Huraira (may Allah be pleased with him) was not as judicious as the other Companions. Most of the Ahadith that Christians quote to make their points are narrated by Hazrat Abu Huraira (may Allah be pleased with him) who could narrate traditions out of context. Similarly there are some traditions of the Promised Messiah (on whom be peace) which have been narrated out of context. It was written about him that when a day was left in the Abdullah Atham time limit the Promised Messiah had some formulaic prayer said on some chick peas which were then thrown in a well outside Qadian. Hazrat Musleh Maud (may Allah be pleased with him) queried why this tradition was recorded as it was completely opposite to the practice of the Promised Messiah (on whom be peace). Upon enquiring it was found out that this took place in a dream someone had and the Promised Messiah (on whom be peace) simply asked to have the dream enacted. Sometimes dreams are enacted so that if God wills He can remove their bad effect. This is proven from Ahadith. When the Holy Prophet (peace and blessings of Allah be on him) saw Suraqa wearing gold bangles belonging to Chosroes in a vision it indicated that Islam would triumph over Persia. Since seeing gold in dream is interpreted as trouble or grief, the indication was also that after victory of Persia the Persians may create some problems. Hazrat Umer (may Allah be pleased with him) compelled Suraqa to wear the gold bangles to fulfil the vision but also because he wanted to avert any hazardous effects. Hazrat Musleh Maud (may Allah be pleased with him) gave a sermon in which in advised Jama’at to avoid conflicts as he said the Jama’at had attained maturity. He then informed the congregation that a person had been excommunicated after which he started the second [Arabic] part of his sermon when a person stood up and asked what was the person who had been excommunicated while another remarked that one does not talk during sermon. Hazrat Musleh Maud (may Allah be pleased with him) smiled and narrated an incident. When the Promised Messiah’s (on whom be peace) residence was searched after the murder of Lekh Ram the superintendent police hit his head on a low doorway and was hurt and felt dizzy. He was offered some milk but he declined saying he was on duty. On this, the same person who had asked for the name of the excommunicated person asked the Promised Messiah (on whom be peace) if the police officer’s head had bled or not. The Promised Messiah (on whom be peace) smiled and said he did not know as he had not taken his cap off to have a look. Hazrat Musleh Maud (may Allah be pleased with him) said some people have the habit to speak needlessly. He narrated an anecdote where a person came to a mosque while congregational Prayer was being said. The man greeted everyone out aloud and one worshipper, while offering Salat responded to his greeting. On this, the person standing next to him said, don’t you know one does not speak during Salat? Why did you respond to his greeting! Friday sermon is part of Friday Prayers and speaking during it is not allowed. The Imam may say something if he needs to but the congregation should not. This should be instilled in children from an early age.